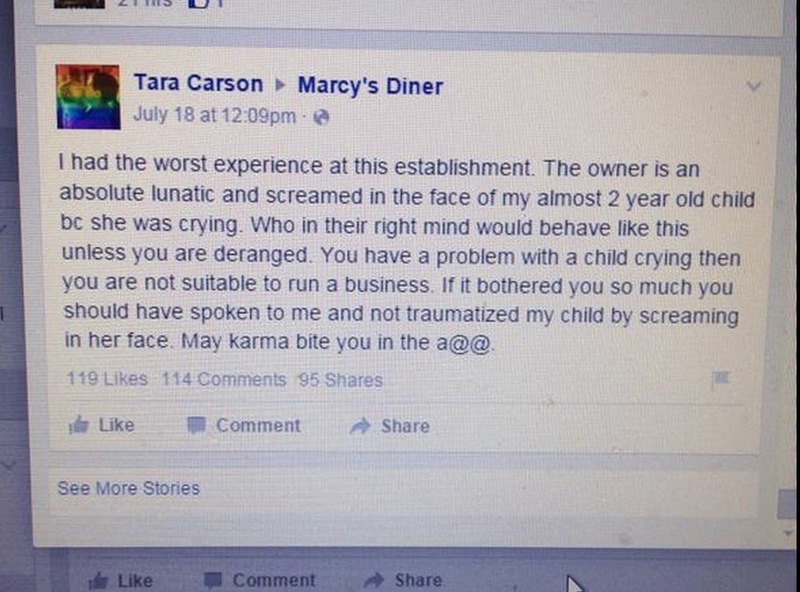 Tara Carson is the name of the mother involved in the incident that happened at a Maine diner this week in which Marcy’s Diner owner Darla Neugebauer yelled at her 21-month-old daughter. Carson had previously taken to Facebook to complain about what happened. Neugebauer then told her side of the story and started to receive a wave of support from around the nation. Now the mom of the girl she reportedly yelled at is speaking out via Washington Post editorial in an attempt to set the record straight and tell her side of things. But thus far, she is still getting a lot of kickback from commenters, who find her explanation less than satisfactory. Tara Carson then claimed that her daughter was fussy when the meal arrived, so they decided to “eat quickly and leave” and that’s when Neugebauer came over with the to-go boxes and issued the ultimatum for them to leave. While the Tara Carson explanation is certainly well-stated, it isn’t exactly winning over the masses. Some commenters have pointed out that it was the parents’ fault for not bringing enough toys and snacks to appease a toddler, who was forced to wait 30 minutes for a table and 40 minutes for her food. The “compassion” comment at the end also angered several. One mom also said the comment about “this is exactly what I’m raising you not to be” was condescending and entitled. “That may be the worst statement she could’ve made,” adding that Tara Carson shows through that statement “she is raising her daughter to be as entitled as she thought she was” and that she’s “trying to place blame with the only person willing to take control of the situation” and that “she’s completely unaware that her and her child’s actions have consequences. So what do you think about the response, readers? Does Tara Carson show that she is an entitled parent or reasonable and well-spoken in her response? Sound off in the comments section.